Digital Readout Systems - Best Deals! Ask For Darren to get immediate technical support. Digital Readout Fitting service available! Note: Nationwide fitting service available from strategically positioned specialist engineers. Our Kits are also ideal for self fitting with extensive instructions and machines specific kits - we can also offer full support over the phone or by email when self fitting. 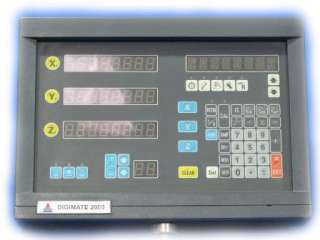 Digital readout systems are available for all the most popular makes of machine. Full systems supplied from 120mm to 3000mm scales all from stock and same day shipping. Up to 6000mm scales ready for special order. Full systems come complete with 2 or 3 axis console fitting arm scales and scale covers plus full machine tailored fitting kits, manuals full fitting instructions and warranty. Dean Smith Grace Type 13 lathe, Dean Smith and Grace type 17 lathe, Dean Smith & Grace Type 26 Lathe. Digital readout repair no fix no fee repairs are normally only £125.00 plus vat. Replacement consoles 2 axis from only £265 plus vat. Our digital readout consoles will plug straight into your old console, we offer direct replacement console for all the main manufacturers. Heidenhain Digital readout console with 22mm round 8 pin and centre connectors for the Digital readout glass scales. Commonly Fitted to the Bridgeport milling machine.A full repair service is available on this type of console. 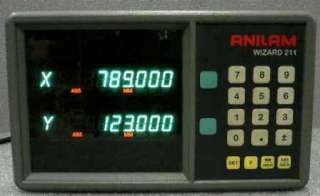 Anilam Wizard Digital readout console with 9 pin D type linear scale connector. We also specialize in the older style Anilam wizard consoles with the 6 pin round linear scale connectors. We offer a full repair service for the entire Anilam digital readout range of scales and consoles. Mitutoyo Digital readout counter console with 15 pin d Type linear scale connectors. 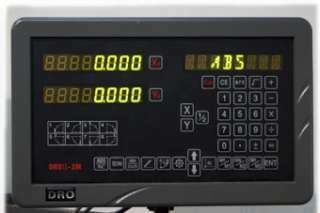 We offer a full repair service for the entire Mitutoyo digital readout range of scales and consoles. 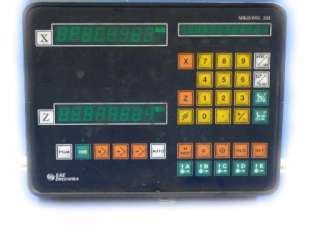 Digital readout console with 9 pin Dtype connectors for the scales. We believe these were actually manufactured by Heidenhain hence the striking similarity to the Heidenhain console. We offer a full repair and replacement service on these consoles that were commonly fitted to the Bridgeport Milling machine. 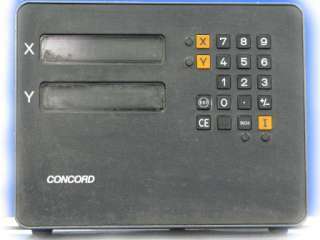 Goodwin Dro Digital readout console with 6 pin round connector for the scales. The 6 pin roundmilitary connector is also used by Anilam and Acu-Rite to connect their older style scales. 9 pin D type connectors. This style of console was manufactured in the early eighties and we still offer a full repair and replacement service. 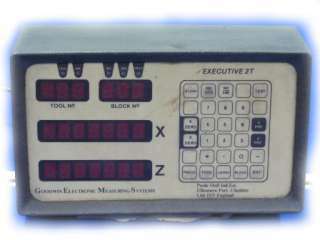 EAE Digital readout console available in 2 and 3 axis. We have had quite few of this type consoles in for repair so we very experienced with this relatively rare make of digital readout. 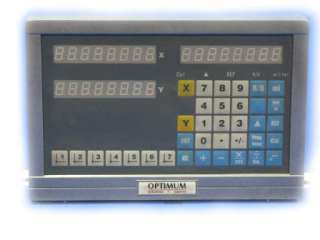 Optimum Digital readout console available in 2 and 3 axis. Distributed from Germany and made in China. It's actually a Sine wave scale and console configuration but still we can offer a repair and direct replacement console. 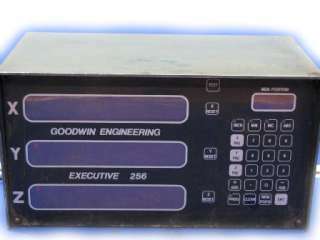 Goodwin Executive 256 Digital readout console available in 2 and 3 axis. 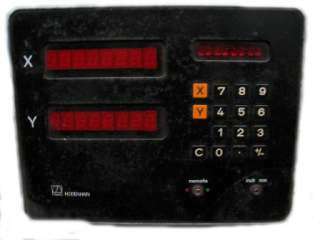 One of our first digital readout consoles, manufactured by us from 1977 onwards. Again we still offer repair and a direct upgrade replacement console. We are still getting these consoles back in for service now after 30 plus years in field, that's how well built they are. If you can't see your actual console listed here don't worry we can repair and replace almost every type of console or scale at a fraction of the OEM cost. Call on 0151 608 8666: We can do a quick fault find and often a repair over the phone and may get you back in production again very soon.